A plant sits on a table with a grow lamp on either side. One of the grow lamps is on. 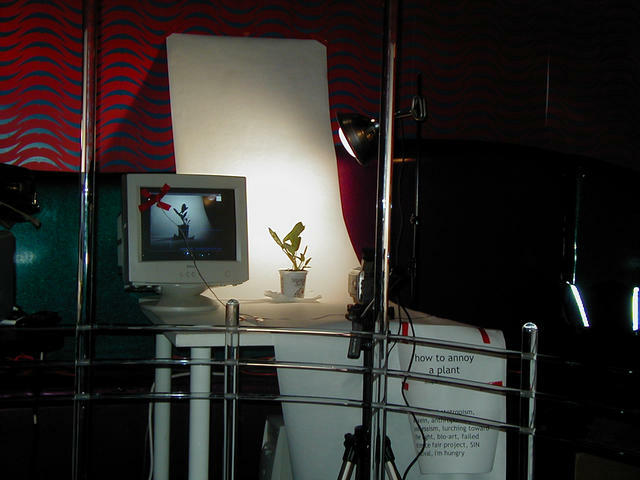 A digital camera, connected to a computer, takes a picture of the plant every ten minutes. 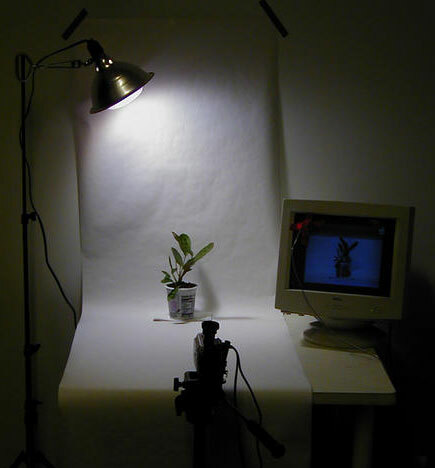 The computer analyses the image of the plant to see how far it has grown towards the grow lamp. Once it passes a certain threshold, the currently lit grow lamp is turned off and the other is turned on. The plant begins to grow towards the other lamp. This process is repeated ad infinitum. The plant becomes annoyed. One iteration takes from one hour to several days, depending on the species of plant used and the lighting conditions in the room. 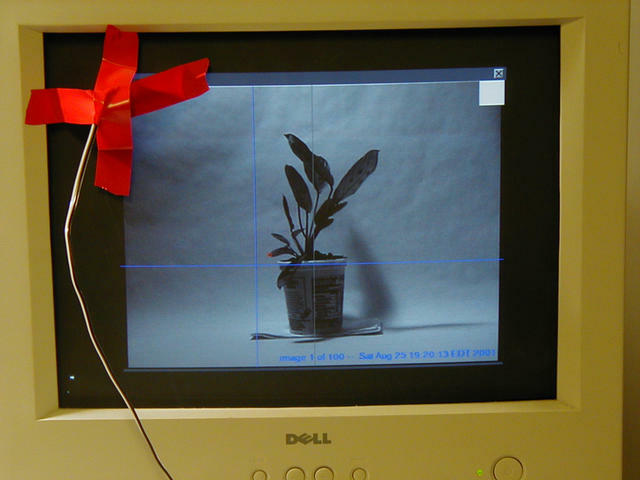 A computer monitor near the plant plays a continous time-lapse loop of the images taken in the last 24 hours, allowing the viewer to watch the plant's progress on a human-friendly time scale. There are several versions of this piece. One variation uses a prayer plant (maranta leuconeura kerchoveana), the leaves of which fold and unfold as the light changes. In that version there is only one overhead grow lamp which is turned on and off to make the leaves move. How to Annoy a Plant is a work in progress. I'm working to find a good, hardy species of plant that responds rapidly to changes in light and can withstand the heat of the grow lamps for long stretches of time. 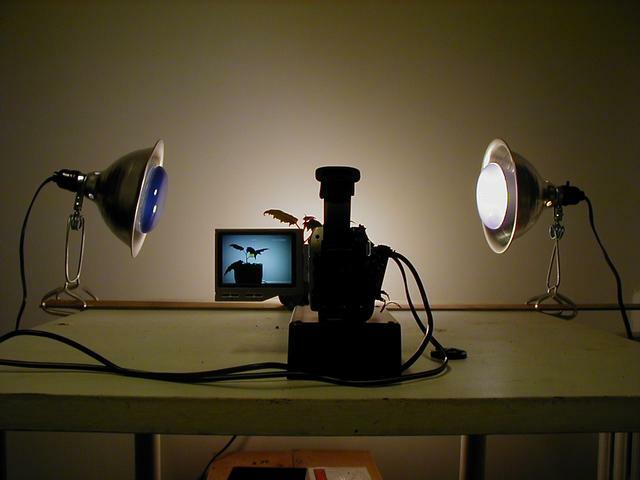 I'm also trying to work out a good way to make the setup immune from environmental lighting, without having to mount the piece in a big clunky light-proof box. I am fascinated by the nearly irresistible anthropomorphic impulse in humans. The idea that a plant could feel "annoyed" is pretty silly, and despite the fact that for many plants phototropism is a vital survival strategy and that changing the location of the light source is actually beneficial to the plant, I can't help but feel a bit guilty as the poor thing zigzags back and forth in its endless pursuit of energy. I also like to think about different ways that living organisms and systems experience or are affected by the passage of time. For the most part, plants and humans operate on very different time bases. Timelapse photography allows me to pretend that I'm getting a glimpse at the magical passage of plant-time. Update: See Fly Away (Not Going Very Far) for a more recent take on these ideas.